Sennheiser’s Set 880 assistive listening device delivers crystal clear, enhanced sound to users with changing hearing needs. Listening enjoyment is guaranteed with intuitive features including pre-set hearing profiles, enhanced speech clarity, volume control for each ear and fast switching between audio sources. The Set 880 is effortlessly simple to set up and use. As we age, our ears need some assistance in order to pick up speech effortlessly or enjoy music to the fullest. This is not only a matter of overall volume but also of processing the audio signal as a whole. So, just turning the TV louder is no solution, apart from the fact that it disturbs the people around us. Enter the Sennheiser Set 880: It lets you personalize your listening experience according to your needs, without affecting your environment. The Set 880 can be connected to two audio sources at once, so you don’t have to unplug and plug in just to switch between TV and radio, for example. Rediscover the joys of listening to your home audio equipment. The Set 880 delivers the boosted sound of your TV and radio sound directly to your ears, without any distractions, so no details will be lost. With a choice of five different preset hearing profiles you always have the right one at hand to optimize speech or music. You can shift the left/right volume balance to improve sound for a “weaker” ear. You can even switch from stereo to mono to get the full audio content in each ear. A unique feature is the Speech Intelligibility function: It reduces TV background noise for you to follow spoken dialog effortlessly. You will see how much more fun it is watching TV or listening to music when the sound is tailored to your needs. Though it brims with features, the Sennheiser Set 880 is sleek and slim. 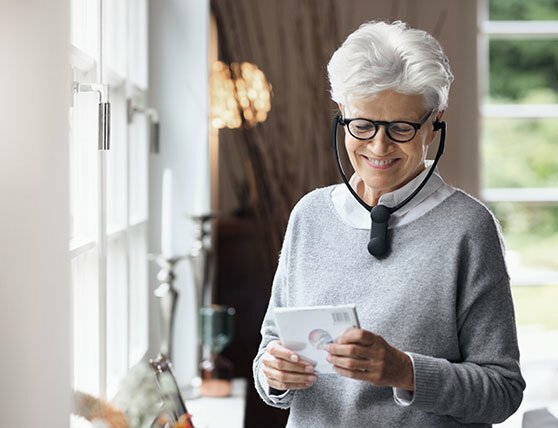 Its lightweight under-the-chin headset applies no pressure to the head, adjusts automatically as you put it on, and does not interfere with your hairstyle or your glasses. Advanced wireless technology ensures a stable connection to the docking station within the range of up to 70 m (200 ft). So, you can go to the kitchen to get a drink while still listening to your program. No need to worry about the battery, either. With up to 18 hours from a single charge the Set 880 lets you listen as long as you like. It recharges automatically as soon as you put the headset on the docking station. From unboxing to the actual listening session, with the Set 880 you always know exactly what to do. Setup is extremely easy and straightforward. Buttons are few, large and clearly marked, so you don’t need glasses to identify them. The same goes for the easy to read LEDs that indicate the battery and connection status at a glance. The Set 880 even switches on and off automatically, so its battery will not run flat accidentally.